Imagine a world where the Pinterest and Yelp apps intersect. That’s the Womzit iPhone app in a nutshell. 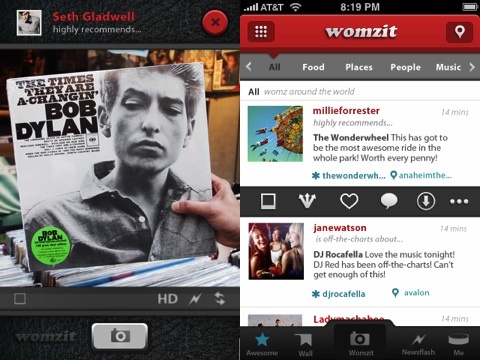 Word of mouth recommendations are transformed into a social networking experience via Womzit for iPhone and iPod Touch. Womzit’s registration process is easy, so you can start spreading your recommendations–aka womzs–quickly. The interface in Womzit is bright, engaging, and stimulating. The successful integration of excellent navigation tools elevates your experience. The screen is filled with thumbnail images of womzs with two menu bars–one at the top and the other at the bottom. The top menu scrolls through the categories of womzs. Categories range from restaurants to websites to stuff for kids to books to fashion to cars. You slide your finger to select, and the screen re-sets with womzs. The response is agile and seamless. The bottom menu has the familiar layout and functionality of Instagram and Pinterest. The most popular womzs are found with a touch on the “awesome” icon. Your womzit “wall” has the similar presence of Pinterest. The most popular “womzs” are highlighted with a larger image and a snapshot of likes, comments, tags, and impressions. The impression aspect will become the fodder of social marketing junkies. Womzit keeps a tally of all of a womz’s impressions across Womzit and places shared. If you share a womz to your Twitter followers and Facebook friends, then you will watch the tally of impressions creep up helping you quantify your reach. You also have a camera within the app to capture and create your womz. Before you take a shot, you select how strongly you feel about the womz. You choose from “recommends,” “highly recommends,” and “off-the-charts.” You also monitor your profile, and Womzit incorporates a feed to monitor the impact of your womz’s impressions in greater detail. This feed is similar to your Twitter “@” feed. Womzit’s in-app camera lets you shoot or upload a photo. You then have the opportunity to add effects to bring texture to your womz’s photograph. This is an interesting and unexpected feature helping Womzit remain current with iPhone photography trends. Womzs are visual, so the quality of your photo will impact its reach. You also want to categorize and properly tag your womz to enhance its impressions. As your womz gains impressions, you earn points and become known as a leader. Womzit also adds an interesting capability for becoming a brand messenger for a week. This is a fresh angle, as it keeps Womzit’s iPhone app slightly more democratic and decreases the ability of social marketing professionals to control content so intensely. The Womzit app for iPhone and iPod Touch takes a cue from Facebook with its ambitions of changing the name of its app into a verb. In the same way you facebook, you will soon womzit virtually anything you encounter and experience in life and online. 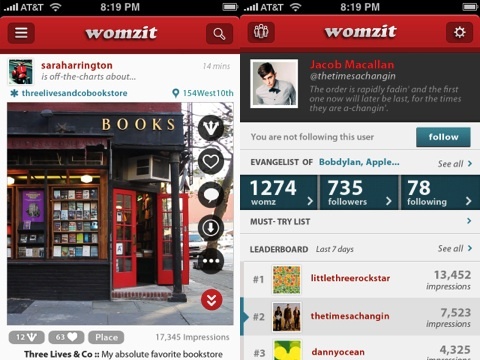 AppSafari review of Womzit was written by Jenni Ward on April 7th, 2012 and categorized under App Store, Free, Photos, Social. Page viewed 3157 times, 1 so far today. Need help on using these apps? Please read the Help Page.